On the night of March 3, 1957 Rudolph (Rezsö) Kasztner became the first Jewish victim of a Jewish political assassination in the State of Israel. He was murdered for what some would consider "playing God," determining which Hungarian Jews to save from extermination during the Holocaust. Like Oskar Schindler, Kasztner negotiated with the Nazis to save lives. Unlike Schindler, however, Kasztner's actions and motives were questioned by Hungarian Holocaust survivors whose families were not included in the select group of Jews to be saved. In 1955, Malkiel Grunwald, a 70-year-old Israeli journalist, attacked Kasztner's character in a self- published newsletter. The libelous pamphlet led to a lawsuit against Grunwald which then exploded into a public debate about what should have been the appropriate actions taken by Jews in the Holocaust. Fifty years later, the moral dilemma remains: Was the saving of a selected number of Jews an act of righteousness or an act of collaboration? There is no question, however, that to act in the face of that dilemma took the courage of a hero. 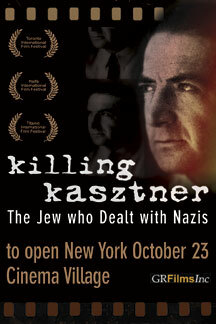 See the new film about Kasztner coming to your theaters now. "... a highly personal, haunting account of a man whose name can still prompt tears of both gratitude and rage." Financial problems? Get payday loans no faxing from LoansAssist!